Are you thinking of starting a blog? Did you just start a blog but don’t know what the next steps should be? 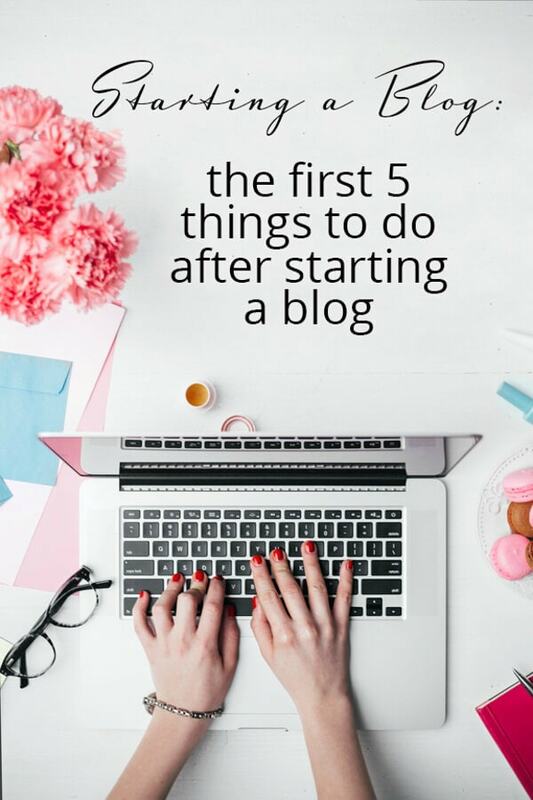 Read all about the first 5 things you need to do after starting a blog. When I started Spoonful of Flavor I had no idea that it would lead me to where I am today. I thought that I was starting a fun little blog to organize my favorite recipes and I was ecstatic when a few hundred people beyond my immediate family read my posts. I knew NOTHING about blogging when I started my blog. Everything I learned about blogging was from trial and error, research or connecting with other bloggers. I learned a lot of things along the way. I wish I knew many of those things even before I hit publish on my first post. I want to share a few tips to help you succeed from day one. If you want to turn your blog into a business then these five steps are even more important. Yes, even before you publish your very first post, here is what you need to do. 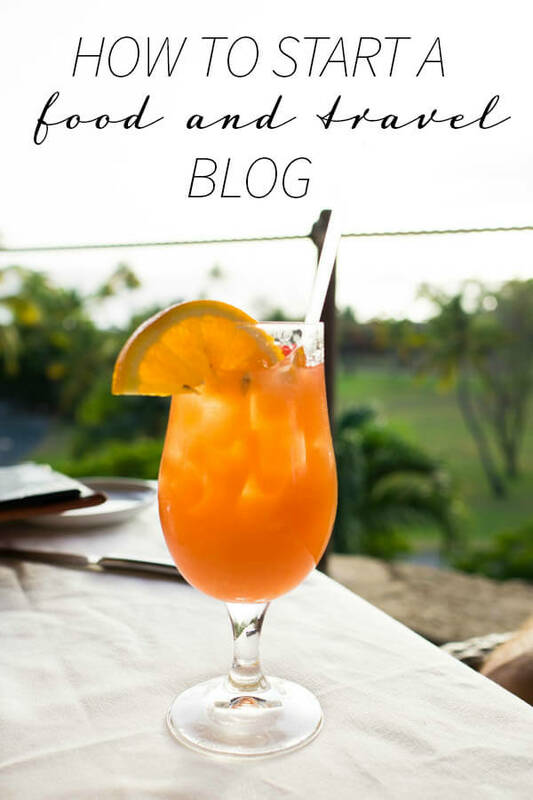 If you haven’t started your blog yet read my post about how to start a food and travel blog. Even if you don’t think you will ever use them, set up all of your social media accounts on day one. When anyone asks me about the first step after starting a blog, I always recommend to set up all social media accounts. Setting up your social media accounts ensures that you can chose your name before someone else. At a minimum, set up accounts on Facebook, Twitter, Instagram, Pinterest and YouTube. You may never use them but at least the accounts are yours. I actually recommend that you start using all the social media accounts from day one too. The sooner you start to build your following, the better. I waited months to set up my social media accounts. If I knew then what I know now I would have started much earlier. Sign up for new forms of social media too. 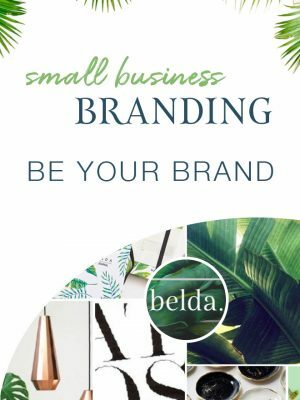 Being a first adopter of social media is incredibly helpful long-term, especially if you want to turn your blog into a business. I’m sure at this point you don’t even know what a permalink structure is, right? A permalink structure is the fixed web address of a specific post or page. Once you select your structure, all posts will be published using the structure. When I set up my blog, I chose the day and name structure but there are other options as well. If I knew what I know now, I would have chosen the “Post Name” structure. In fact, I recommend the post name structure unless you publish multiple posts with similar names multiple times a day. The post name structure is cleaner and some experts believe that it helps more with search engine optimization (SEO). Here is an example of the permalink for this post. After the URL, the year, month and day are followed by the title of the post. The reason I recommend establishing your permalink structure before you even publish your first post is because you want to stick with the same structure throughout the life of your blog. If you want to change the structure down the road, it is very messy. You essentially break the links to every single post you published until that date. You will have to set up redirects and that can be very messy if you don’t do it correctly. I recommend choosing the “post name structure” or “day and name” or “month and name” and stick with that structure throughout the life of your blog. Do not choose “default” or “numeric” because the structure does not include the name. The name is essential for search engine optimization. 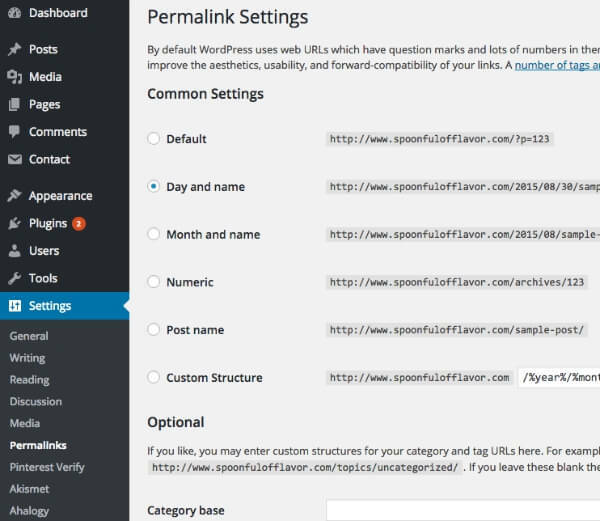 Select your permalink structure, hit save and don’t ever change it again unless you are ready to set up redirects. 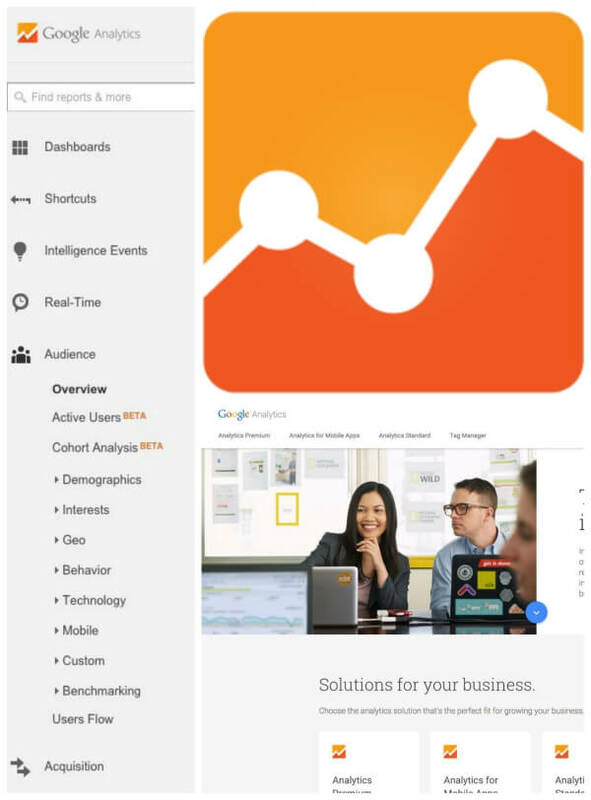 I won’t go into detail about how to set up Google Analytics or Google Webmaster Tools in this post. A lot of great resources on how to set them up and utilize them exist. Google Analytics is important because it tracks your blog statistics. You can track how many people visit your site, what posts they visit and what method of technology they use. In addition, you can track demographic trends and discover more detailed information about your readers. 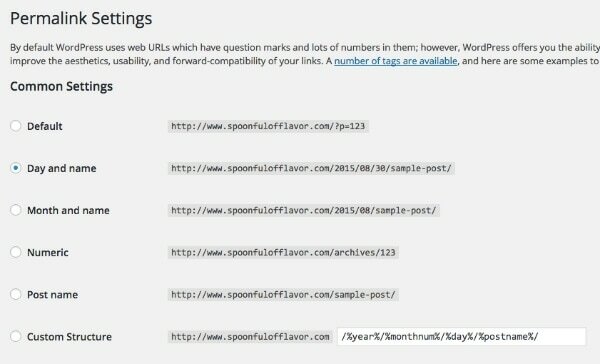 Webmaster Tools provides more detailed data on search traffic and trends. Setting up both Google Analytics and Webmaster Tools is very important to track the growth of your blog and target certain trends. I’m not going to go into detail about Search Engine Optimization (SEO) in this post because it is a very complex topic. You can save yourself a few headaches from revising posts in the future if you establish some good SEO practices from the start. 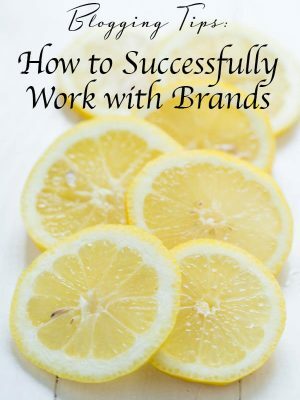 I purchased this guide, SEO for Food Bloggers, to help me learn a little more about SEO. 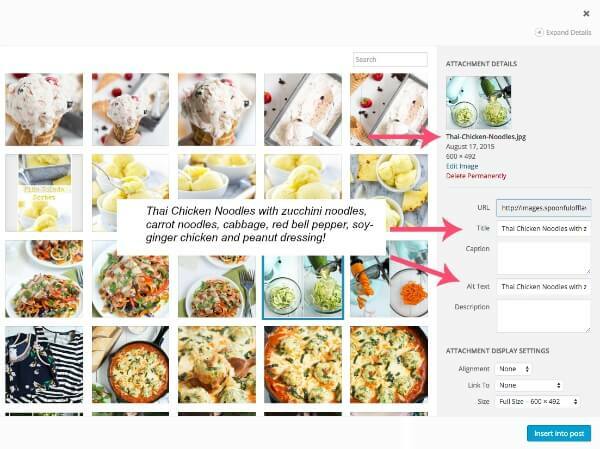 Even before you upload pictures into WordPress, you should save them in a way that will be recognized in search results. “IMG1234” is not pretty or SEO friendly. Instead, name your photos the title of the post. 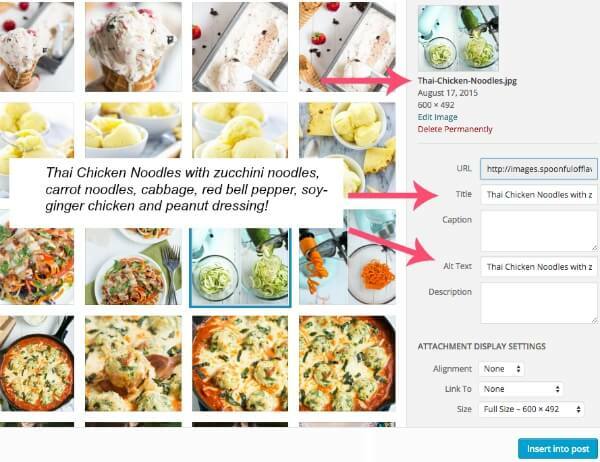 I like to name photos with the post title or recipe title and add a number to distinguish each picture. Read a little about Search Engine Optimization (SEO) before you publish your first post. Familiarize yourself with the basics, install an SEO plugin and continue to research ways to optimize your blog for search engines. I have Yoast SEO plugin, but All in One SEO pack is another option. I like the Yoast plugin because you can start adding basic search engine optimization keywords to your posts without too much research. 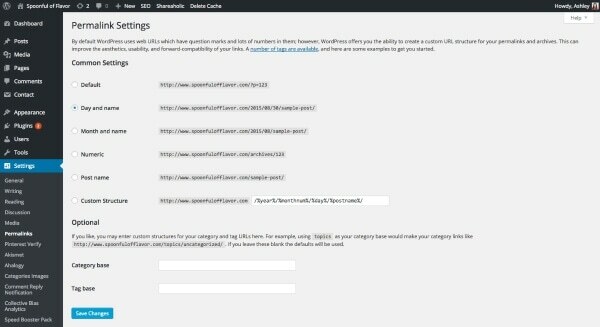 The plugin is user friendly and adds a little box at the end of each of your posts in WordPress. You can enter basic information such as keywords, meta descriptions, and descriptions or images for Facebook. I don’t claim to be an SEO expert, Google Analytics expert or any other expert related to blogging. Everything I learned about blogging was by trial and error, research or connecting with other bloggers. 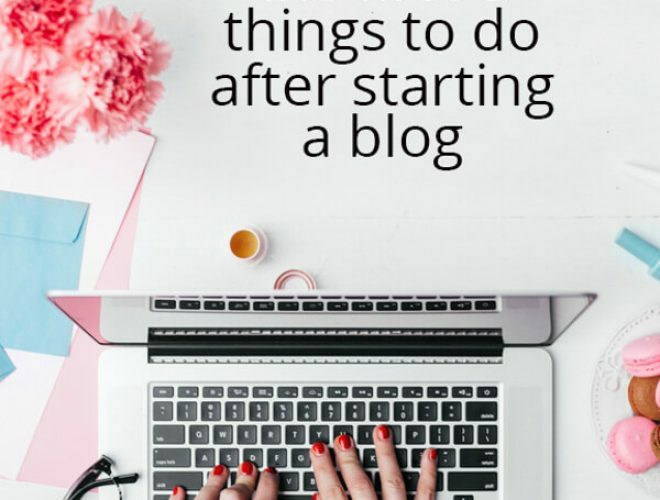 The five tips I shared in this post are things that I wish I knew when I first started blogging. I want you to be successful so I am sharing my tips with you. Do you have a question or tip you want to share with other readers? Leave a comment below. 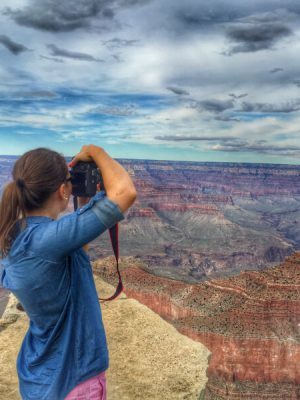 Don’t miss my post on How to Start a Food and Travel Blog! Great post! I am just now starting my blog but its not published yet. I want to make sure I start off on the right foot. This was extremely helpful. Thank you so much for sharing this information as this is really very helpful to get more out of a blog. I have just started a blog on entertainment in India, mentioning the name in website section, could you plz take an overview on the same and let me know if I am doing anything wrong ? As I am planning to get Google AdSense on the blog.Thanks again !! Love the article. I am always looking at ways to improve my pins. Thanks for sharing these tips! Thank you so much for sharing! I am just starting out my blog and your tips were extremely helpful. Ashley, thank you for the great tips! I started my blog about a month ago but got derailed by some medical drama that took me out of the game. Since being out I've been trying to do as much blog research as I can to hit the ground running when I'm feeling better. I have the same feelings as you did about social media but you make a great point on the matter so I will be setting mine up soon, as well as setting the permalinks up by name. One thing I would like to add as something that I wish I had thought more about is what my brand is. It's something that I thought I had a clear image of...until i started. So, luckily, I am just starting but some soul searching is definitely in my future. :) Thanks again! This was a great post! I was able to incorporate these suggestions easily and quickly. Many thanks! Thanks for writing this post, really helpful and I definitely learned something new with that permalink structure :)!!! this is pretty Great!! i liked that you added google Analytics. I'm so glad I could help, Samantha! I'm glad you learned something new, Megan! Thank you for the helpful hacks!